A full year after first teasing Project Scorpio at its last E3 event, Microsoft finally took the wraps of its new console, now called the Xbox One X. Decidedly less catchy than Xbox Scorpio, but it beats all of the Windows-centric Xbox 10 S rumors that were circling around the past few weeks. The tongue-twister of a console is set to arrive November 7, priced at $499, as initially reported. The company has already alluded to a number of features on-board, including backward compatibility and processing power that make it “the most powerful game console to date.” And from the sound of it, Sony can’t really argue here, there’s a ton of firepower under the hood here, designed to keep Microsoft’s mid-life console line both ahead of the competition and up to speed with the latest happenings on the living room A/V front. The world's most powerful console has a name. It’s a fairly minimalist looking system and, impressively, “the smallest Xbox, ever,” according to the company. The new console is, as advertised, capable of true 4K gaming playback, with HDR video quality and Premium Dolby Atmos, keeping with Microsoft’s long-standing desire to be a full living room entertainment experience, rather than simply a gaming machine. Of course, “new console” might be overstating things a bit. Keep in mind, the Xbox One is only about halfway through its lifecycle (the Xbox 360 was kicking for about eight years before its successor launched), but Microsoft still needed to keep up with the times, after the PlayStation Pro arrived with 4K and VR capabilities. Rather than rushing out the next-gen, however, the company has introduced a more capable version of the One. There’s also a pretty robust bump in RAM up to 12GB of memory, coupled with a healthy 326GB/s of memory bandwidth. This is, as advertised, an extremely powerful system, and Microsoft has gone a ways toward eliminating bottlenecking between the graphics and processor. All of those high-powered innards will be liquid-cooled with the sort of vapor chamber you usually find on a server. The company noted that the box is capable of something called “supersampling,” meaning that users won’t need a 4K TV to take advantage of the new video quality. It should look better a plain old standard 1080p set, as well. For those gamers who aren’t spec-obsessed, what all of that means is that the new system is about more than just keeping up with the proverbial Joneses. It’s about helping to future-proof the Xbox One at the halfway mark of its lifecycle. 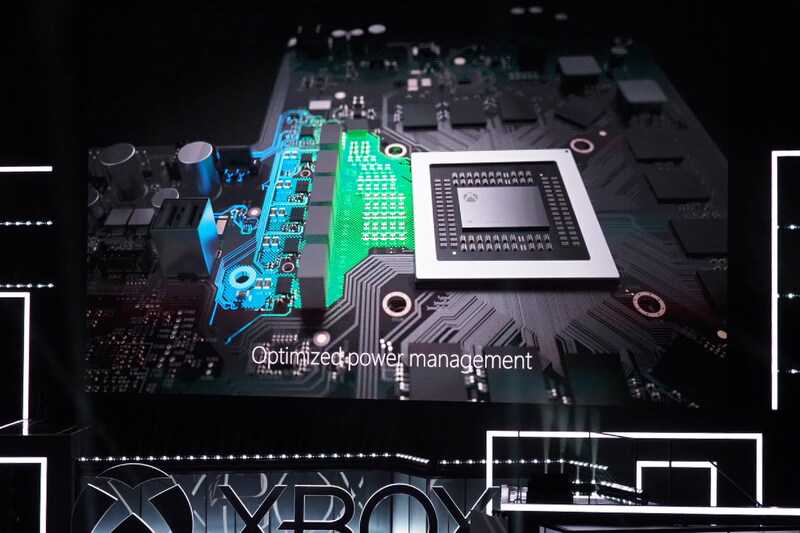 The console will not only be capable of doing 4K res gaming, it also features a little adde kick for when performance requirements invariable increase well before the next-gen Xbox officially arrives. 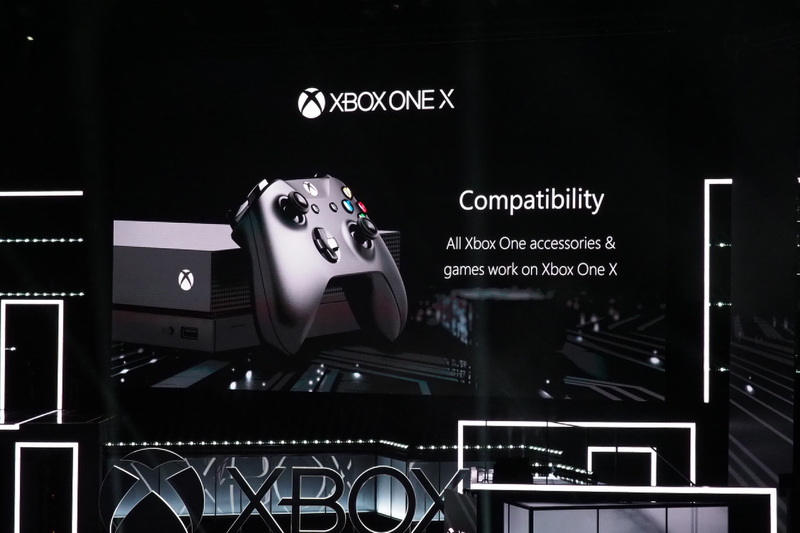 Even more importantly at launch, the system will be compatible with all existing Xbox One games out of the box, along with accessories. No software, no patches. So, there’s plenty of content to get up and running at launch. Microsoft has also promised to make scaling up easy, promising developers that any titles in 900p will be able to run at full frame rates in 4K, a feature it demoed during an early review back in April. The company will also be be helping bring 4K upgrades to a number of Xbox titles, including Gears of War 4, Forza Horizon 3, Killer Instinct, Halo Wars 2 and Minecraft. In fact, the company showed off 42 new titles at today’s E3 event. As it put it on stage, each will work with every member of the Xbox family, though they’ll work “best” with the Xbox One X. That means, among other things, that for cash-strapped users, this won’t exactly be a “must update” like the PlayStation Pro before it. New titles will still be compatible with the versions that came before it — you just won’t get that full 4K experience. For those who do upgrade, the Xbox One X should help keep the line atop the gaming console spec race — at least until the next shoe drops.